Depending on where you are in the world Americans have different reputations. Some perceive us as lazy, while others think of Americans as hustlers, who believe in working hard to get ahead. Data from the Organisation for Economic Co-operation and Development (OECD) shows that Americans work an average of 1,790 hours per year. That is the 15th highest number of hours in the world. 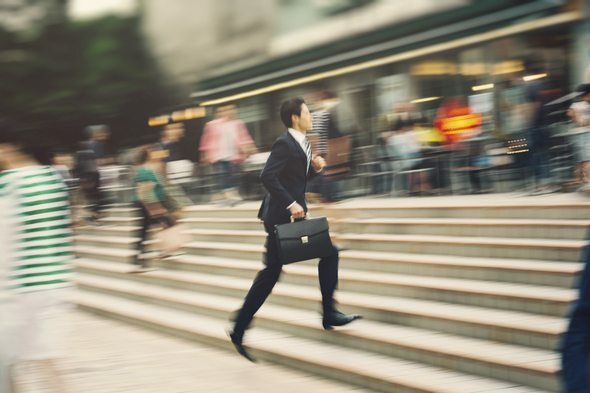 While we can thank the OECD for crunching the numbers so we could compare countries, we at SmartAsset were curious to see how cities within the country fared. 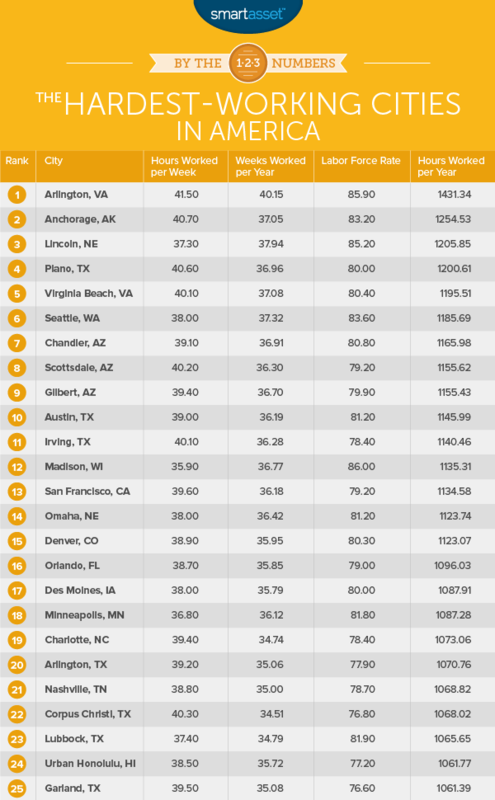 We wanted to find the hardest-working cities in America. Thinking about buying a home? See what your mortgage payment will be with SmartAsset’s mortgage calculator. Hard-working Southwest. Half of the cities in the Top 10 came from the southwestern part of the U.S. (including Texas). Poor Detroit. Detroit comes last in our list. However, with a depressed economy, this could simply be because people would like to work but cannot find work. Therefore, it may not be entirely fair to say that people in Detroit are not hard workers. Fast-growing cities. A number of the hardest-working cities are also the fastest-growing cities in America. Thanks in part to a large federal government presence, the Arlington, VA economy is largely immune to the economic shocks which sometimes rock the rest of the country. Government agencies like the Department of Defense and the Department of Homeland Security are headquartered here. In fact, the Pentagon where the Department of Defense is headquartered is the largest office building in the world. The largest private companies (in terms of employees) in the city are Deloitte and Accenture. Other large private companies owe their presence to the nearby Department of Defense, like LockHeed Martin. All in all, workers in in Arlington work an average of 1,431 hours per year. In a state known for its ruggedness, it’s probably no surprise that Alaska’s largest city is a hard-working city. Workers of Anchorage work an average of 40.7 hours per week and 37 weeks a year. With a labor force participation rate of 83.2 percent that is good enough for fifth place on our list. A large portion of Alaska’s economy is based around resource extraction and Anchorage is no exception. Many offices and headquarters for the resource extraction firms, like ConocoPhillips and BP, are located in Anchorage. One of the best cities for creatives, Lincoln is also one of the hardest working. The city has a low unemployment rate and high amount of hours worked per worker. There may even be a labor shortage, hourly wages grew 8.5% from October 2014 to October 2015. The hardest-working city in Texas is Plano. Workers actually work more hours per week there than in third-place Lincoln. But because of the city’s lower labor force participation rate (80%) they fall to fourth place. An estimated 13.2 million people visit the city every year. 2.3 million are international visitors. One reason for the tourism is the beach from which the city takes its name. According to the Guinness Book of World Records, Virginia Beach is home to the largest pleasure beach in the world. Hopefully after a hard day’s work the Virginia Beach residents find some time to enjoy it. Chandler finished first in what was a close contest for the crown of hardest-working city in Arizona. Chandler workers work an average of 39.1 hours per week, 36.9 weeks per year for a total of 1,443 hours per year. Factoring in the labor force participation rate of 80.8%, residents of Chandler work an average of 1,165 hours per year. The largest employer in the city is Intel. The workers of Scottsdale, AZ actually work more than their Chandler counterparts. The difference is that because less people in Scottsdale are working they have a lower overall hours worked per resident. The final Arizona city in the top 10, Gilbert should not feel too bad about being 9th. The residents of Gilbert work only 12 minutes less per year than their Scottsdale neighbors. Gilbert is one of the fastest-growing cities in the country. It has grown from only 5,700 residents in 1980 to more than 240,000 today. The Gilbert Public Schools are the largest employer in the city, followed by Banner Health and the Mercy Gilbert Medical Center. 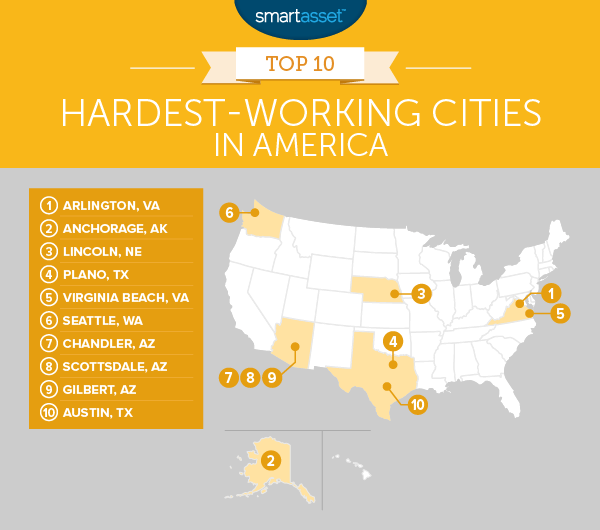 The capital of Texas and final city in the top 10 hardest-working U.S. cities, Austin is another very fast-growing city. It is also a great city for hard-working people looking for new career opportunities. Austin workers don’t work as much as much as some other cities below them in the ranking but thanks to the strong economy 81.2% of people in Austin do some work every year.